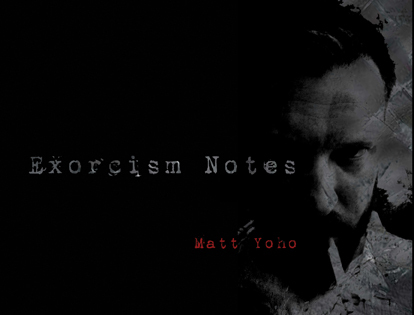 NX Gallery presents: Matt Yoho – “Exorcism Notes” Showing July 8th – 30th Artist Reception July 11th 6-9 pm In his own words: Deus ex machine, ergo sum. Which roughly translated is: god (ghost, spirit) in the machine, therefore I am. My work, particularly in the last year, has a certain amount of introspection and darkness contained within it. For me, creating a meaningful work of art isn’t about copying, or even re-imagining the world around me. It’s about digging around inside myself – sifting through memories, occurrences, and emotions; and bringing these parts of myself together in an external representation. For instance I deal with a lot of imagery that isn’t the most pleasant: conjoined twins, revolvers, my own face; and a lot of times I will use text that’s biblical or psychological in origin because those are the ideas that resonate within me on one level and appall me on another level. I think this is a good metaphor for my inner life and maybe the lives of a lot of other people: On one hand life is great, on the other hand life is horrible. Most likely a lot of the themes in my work come from growing up in rural West Virginia. Where I grew up we had abandoned farms, hollows full of dumped cars from the 50’s, all set in hills and forests so thick the ground never saw the light of day. So, I’m digging around in my subconscious, panning through this and that, and finding those little golden nuggets of idiosyncratic paradoxes and putting them on display for all the world to see.